Rainbow Road in Super Smash Bros. for Nintendo 3DS. This page is about the stage in Super Smash Bros. for Nintendo 3DS. For the song in Brawl, see here. Rainbow Road (レインボーロード, Rainbow Road) is a stage in Super Smash Bros. for Nintendo 3DS. It is based on the Rainbow Road course from Mario Kart 7. 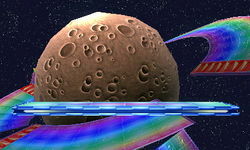 Rainbow Road consists of a flat rainbow platform that travels around the track and landing in several areas. Some of those destinations include the rings of Saturn, a white polka-dotted mushroom trampoline, the finish line, and a moon. It is a cruise-style stage similar to Port Town Aero Dive, Delfino Plaza, Mute City, and Skyloft. Much like in Mario Circuit, Shy Guys will drive around the course and serve as damage-dealing obstacles. Like in Mute City, touching the track while the moving platform is in motion deals upwards knockback. The stage only consists of a single platform which does not follow the track, instead remaining still above the split-up roads following the tube. The omega form depicts these roads as curved; in both the stage and the racetrack, the roads are straight. Rainbow Road as it appears in Mario Kart 7. Rainbow Road first appeared in Super Mario Kart as the final course of the Special Cup, and has appeared in every main Mario Kart game since. This Rainbow Road is based on the Mario Kart 7 version. Shy Guys debuted in Mario Kart DS as the only drivers recipient players of DS Download Play could play as, but made their proper debut as part of the roster in Mario Kart 7. In this stage, Shy Guys drive in their Standard Kart. This beautiful seven-color course is the finale of the Special Cup in Mario Kart 7. Set high above in space, drivers navigate the rings of Saturn and cross craters on the moon. Shy Guys are racing on this course as the fighters compete on and around it, and they have no problem hitting you with their karts. The Special Cup's final course in Mario Kart 7. This space track takes you through Saturn's rings and the craters on the moon. While fighting on the Rainbow Road stage, you'll fly around and sometimes even descend onto the track itself. Watch out! Shy Guys are having a proper race down there, and they don't brake for anyone! Fox, Wii Fit Trainer, and a few Shy Guys on the stage. Zelda attacking Samus in this stage. Lucario using Extreme Speed on the stage. The moving platform moving past the finish line. Rosalina and Samus fighting on the stage. Ryu on the stage while passing by the moon and a planet. Shy Guys on karts hitting fighters. Yoshi, Luigi, Diddy Kong, and Fox passing by a sharp turn. King Dedede, Rosalina, and Yoshi near a planet. Mario, Kirby, and Samus going through a tunnel. Bowser Jr. and a Chain Chomp at the finish line. Mario, Kirby, Samus, and Toon Link in an area full of jump ramps. Luigi and Yoshi with a close-up of a Shy Guy. The track in the stage is slightly altered from its original appearance in Mario Kart 7. All of the speed/gliding ramps are missing. Despite this, Shy Guys can still be seen with their gliders. The mushroom-based platforms on the course no longer bounce racers off them. The area right before the second section sign is no longer bumpy on the sides. Saturn's ring doesn't have breaks in it on the sides. The road right before the moon no longer bounces. The rainbow track layer is notably thicker, as opposed to the thin layer from the original. Coincidentally, the SNES Rainbow Road remake and the Rainbow Roads from Mario Kart 8 and Mario Kart 8 Deluxe posses this trait. The stage's starting line is extended at the beginning of the stage, in spite of the fact that it can appear at its normal length when the stage is stopped by the starting line. It is to make way for the touring platform. Rainbow Road and Melee's Mushroom Kingdom are the only two Mario stages not to appear in Super Smash Bros. Ultimate. Additionally, this stage and Pac-Maze are the only new stages in Smash 3DS (not counting Battlefield and Final Destination) to not appear in Ultimate. This page was last edited on April 17, 2019, at 02:25.